&ldquo;I long ago learned the advantages of patience&rdquo; &mdash; Scorpius. Beginning a bold new direction in the second exciting year of BOOM! 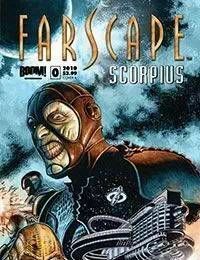 Studios&rsquo; officially licensed Farscape comics! A solo Scorpius series, sure to excite and energize all of Farscape fandom! A frightening, black-leather clad presence with a face&nbsp;like a skull &mdash; the half-breed Scorpius &mdash; takes his villainy to new heights.